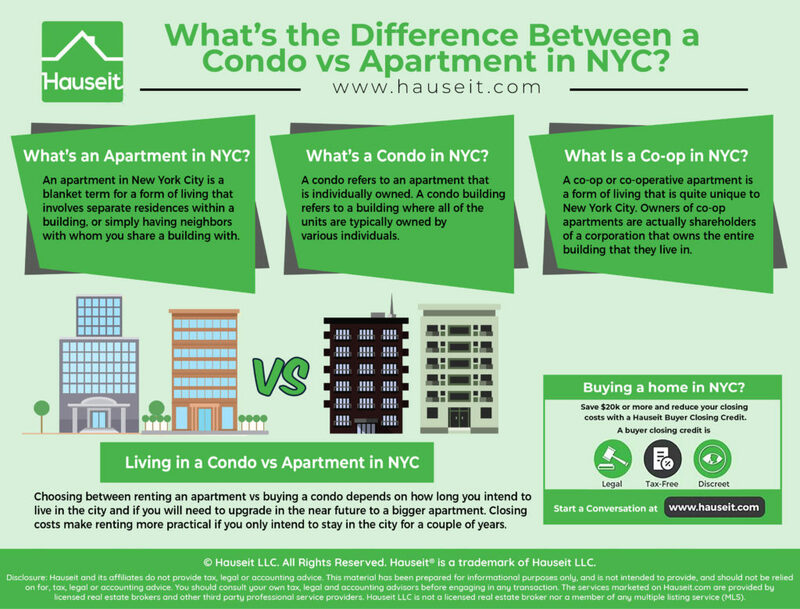 What’s the Difference Between a Condo vs Apartment in NYC? An apartment is a general term for a separate residence within a larger building. Apartments in NYC can either be individually owned condominium units, co-op apartments or one unit of a rental building that is entirely owned by one landlord. 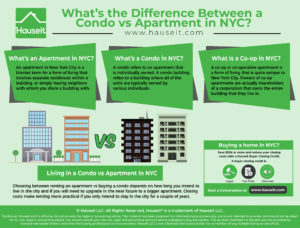 Many folks moving to New York City for the first time will be confused by the difference between a condo vs apartment. Often times properties will be listed as simply an “apartment” on major real estate search websites, and home buyers will become confused to later find out that it is actually a condo or a coop. We’ll explain in this article the difference between a condo vs apartment in NYC. Condo vs Apartment – What’s the Difference? What’s a Condo in NYC? What Is a Co op in NYC? As we’ve discussed above, an apartment in New York City is a blanket term for a form of living that involves separate residences within a building, or simply having neighbors with whom you share a building with. This should not be a surprise for anyone given the high property values and population density of NYC. Not many people can afford buying a house in NYC! It’s too expensive for most New Yorkers to have a townhouse or building entirely to themselves! Simply put, a condo is simply a more specific form of an apartment. That means a condo will always be an apartment, but an apartment doesn’t necessarily always have to be a condo. An apartment can also be a co-op unit, a condop unit or a rental unit that’s part of building that’s wholly owned by one landlord. Often times in NYC, large high-rises will be entirely composed of rental units that are owned and managed by one landlord. However, a rental unit can also be part of a smaller multi-family brownstone where the owner lives in one of the apartments and rents out the other units. For example, a legal two family townhouse will typically have an owner’s duplex or even triplex on the upper floors, and a garden apartment on the lower floor to rent out. A condo refers to an apartment that is individually owned. A condo building refers to a building where all of the units are typically owned by various individuals. Ownership is not limited to one apartment per individual. For example, some owners may opt to buy their neighbor’s apartment in NYC to combine the units into a larger apartment. Furthermore, some investors may own multiple condos in the same building and in other buildings. Therefore, the main difference between a condo vs apartment is ownership. When a person says they live in a condo, they are typically letting you know that they own their own home. In contrast, renters will usually be oblivious to whether they are renting a condo, co-op or a unit in a 100% rental building. That’s why renters will typically talk about their apartment vs being more specific about the type of apartment they have. A co op or co-operative apartment is a form of living that is quite unique to New York City. Owners of co op apartments are actually shareholders of a corporation that owns the entire building that they live in. Shareholders receive a stock certificate and a proprietary lease that lets them occupy their specific apartment. As a result, co-op shareholders are not actually real property owners, but rather owners of shares of a corporation that happens to own an apartment building. The cooperative corporation is run by a board of directors that is elected by the shareholder base. Coops are known for stricter rules and regulations and sublet policies versus condos, and the board of directors exercises enormous power over the shareholder tenants. Coop boards require potential purchasers or subletters to submit a lengthy and invasive co-op board application in addition to passing a coop board interview. Co-op boards can reject an application for any reason without having to disclose the reason why. Even though this can result in various forms of discrimination, in reality the reason most rejections happen is because the applicant did not meet the co-op’s financial requirements. Therefore, the main difference between a co op vs apartment is ownership. When a person says they have a co op apartment, they’re telling you that they effectively own their own home. Some co op shareholder tenants may actually be embarrassed about telling their friends that they live in a coop vs a condo because of the lower price per square foot typically associated with co op apartments (primarily due to restrictions on subleasing and lack of real property rights). On the other hand, some New Yorkers will take pride in telling acquaintances that they live in an exclusive co op building in a ritzy part of town where the co op board is extremely selective about who gets to live there. Whether you choose to live in a condo vs apartment in NYC depends on whether you’re ready to become a first time home buyer. If you’ve saved enough to cover a standard 20% down payment plus funds to cover your NYC closing costs and a cushion for post-closing liquidity, then it may make sense for you to become a home owner! The decision between a condo vs apartment in New York City will also depend on how long you intend to live in the city and if you will need to upgrade in the near future to a bigger apartment. If you may need to move for a new job or if you’ll need a bigger apartment because you plan on having kids in a few years then it may not make sense to buy. That’s because closing costs in NYC can be significant, even though there are ways to save these days through seller concessions to closing costs and broker commission rebates. And when it comes time to sell, you can potentially save up to all 6% of the traditional broker commission through a flat fee MLS listing. 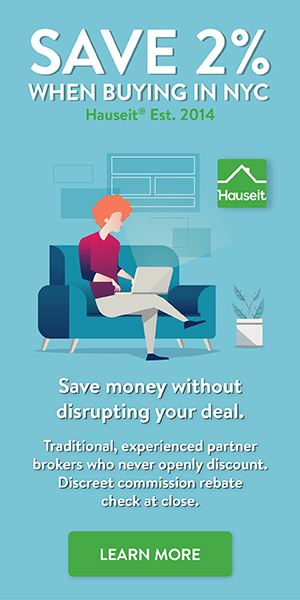 If you definitely need the assistance of a full service broker when it comes time to sell, you can still do so relatively affordably through a Full Service for 1% listing through Hauseit. If the stars are aligned and you intend to live in the city for many years to come in the same apartment, then it may truly make sense to buy and start building home equity instead of throwing away your earnings on rent. You’ll simply need to decide on whether to buy a condo vs a coop. Although co-ops will be cheaper and you will be able to buy more space for the same amount of money vs a condo, you’ll need to study whether buying a coop is a good investment or not. It’s not a surprise given all of the constraints around coops that many New Yorkers feel that the only positive aspect of coops is their cheapness! Ready to take the leap on home ownership? First do your research and study our guide on how to buy an apartment in NYC. Best of luck and enjoy your time apartment hunting in the world’s greatest city! Condominium Budget – What is a Condo Budget? Thanks for letting me know that a lot of potential renters are a bit confused between an apartment and a condo in NYC. Thanks for explaining the difference. My sister plans to move to New York next month for her new job, and she is planning to rent. I will advise her not to be confused when renting an apartment. I will let her read your article for reference.